The Dev-Team has put an update on their blog about what you need to know before the release of iOS 4.2. Below is what they have to say about both jailbreaking and unlocking. • Thanks to geohot’s limera1n exploit, and our original pwnage2 exploit, and @pod2g’s ipod2g-MC exploit, absolutely all devices at all iOS firmware versions are capable of being jailbroken. 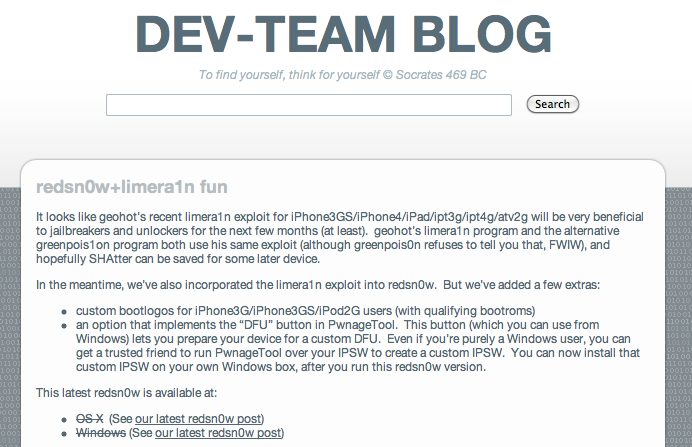 • The untethered jailbreak of those very latest FWs and latest devices depends on @comex hacks. His hacks so far extend only to 4.1 and 4.2beta3. He’s working on a way to extend it to 4.2 and beyond. Just wait for him to work out his method. • iPhone4 unlockers are not left out in the cold. @sherif_hashim has found some very promising avenues to pursue. Those will be explored as soon as possible after all the 4.2 madness. • If you’re an unlocker, just stay where you are. Please, just stay where you are. Any mistakes you make now may be permanent. • If you only care about the jailbreak and you’re absolutely sure you have your personalized 4.1 SHSH hashes, feel free to experiment but keep in mind that any mistakes you make may result in your losing pictures or notes or bookmarks that you’d rather keep. Honestly unless you love living on the bleeding edge, it’s better to just wait for official updates from Cydia/redsn0w/PwnageTool. Apple has released the new version of firmware for all devices (besides first generations of course), version 4.2, to developers. The final, gold master file is ready. This means it will install even if you’re not a developer. This is the firmware that brings folders and backgrounding to the iPad and printing to all devices! The firmware will probably be out officially from Apple via iTunes within a week or so but if you want it early, follow the directions below. If you want to jailbreak, see the instructions following the update instructions.